Gear - For me this is the most boring topic so lets get this one out of the way. Generally you will need the longest lens in your kit but there might be times when you want a wider environmental style shot so a zoom lens like a 200-500 mm is nice. I use the Nikkor 500 mm F4 sometimes paired with my 1.4x teleconvertor giving me 700 mm on my full frame Nikon D850. I generally handhold for most of my shots since I like the freedom of movement especially when trying to approach skittish subjects. Recently I created myself a ground pod using a cheap frying pan which I mount my Jobu Jr Gimbal on (shown below). You can also use a tripod that allows you to get low, these typically include ones without a center column. One thing I hated about using a tripod is the fact that most surfaces aren’t level where you will be shooting, so often times it is difficult to get the legs in an area that would allow the tripod to be extremely low. Since the ground pod covers less space and has no legs for you to have to contend with it makes for the perfect support system in my eyes. Camera Settings - To be honest this is not an easy topic to cover since really the camera settings all depend on the light and the type of shooting situation you are in. But for general purposes I like to use the following base settings. For ducks just wading in the water I use a shutter speed of 1/400s or higher, an aperture of F5.6, and the ISO could be anything in order to get the proper exposure. For preening waterfowl or in-flights I like to be up around 1/1600s or higher for my shutter speed. The Approach - Waterfowl are very keen about their surroundings and often wary about movement. When heading out to photograph waterfowl I tend to arrive at a location before sunrise which allows me to get into position without being noticed. For very skittish subjects I will use a pull over blind but generally I find if you stay motionless in one spot (in a laying position) your subject will not see you as a threat. Each subject is different so you need to study their behaviors and tendencies. Take for example diving ducks like this female Long Tailed Duck which I spotted in an estuary not far from my home. When I first spotted her I took note of how long she dove, then timed my approach to the shoreline during each dive. This allowed me to get into the shooting position I wanted without spooking her. There may also be situations where the use of a Kayak or floating hide can work to your advantage as well but this is something I have not practiced myself but hope to in the near future. Shooting Angle - LOW LOW LOW…I say it all the time that a low shooting position is key. This means laying flat on your stomach at the end of lake or pond. Keep in mind that even if you are laying flat at the edge of a body of water the bank you are on might be a foot or so above the water. In those cases getting into the water with chest waders will help get the desired low angle. Below you can see that at this location I can literally be inches off the water without actually getting in. Weather - The best type of weather I find for waterfowl is when the wind is low (allowing for nice still water to reflect the surrounding foliage) and semi cloudy days. Something around 30-40% cloud coverage. This allows for nice colors in the water if there lot of foliage to reflect into the water and hopefully the little cloud you do have mutes out the sun once it gets too intense. Though I like to photography on more clear days shooting in the rain or snow can provide some unique shoots as well. The key with those situations is again to have a location with lots of foliage or dark elements in your background to highlight the falling snow or rain. Also during those times try different shutter speeds as slowing things down to 1/60 or maybe even 1/100s can help the falling perception look more pleasing. 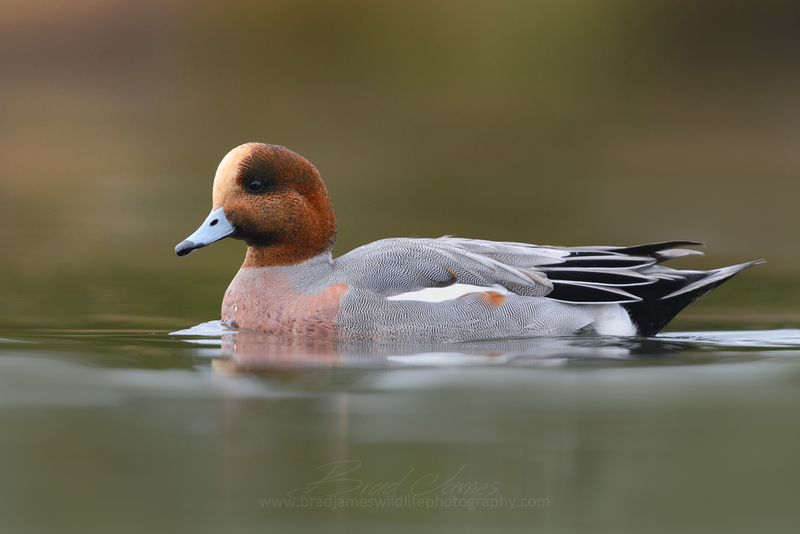 Below is a female Eurasian Wigeon on a snowy day in December. Creating Interest - There are a few key moments I feel with waterfowl that can help create moments of interest in your images. The first and probably the most obvious is during preening. When your subject decides its time to clean when you should focus in on this individual as they will batheing and cleaning their feathers which can provide some unique poses and displays of feather detail that you wouldn’t normally see as they glide along the water. This female Green-winged Teal is a great example with her feathers spread out revealing the stunning colors beneath that are often hidden. Another opportunity to create interest is between moments of interactions between subjects. 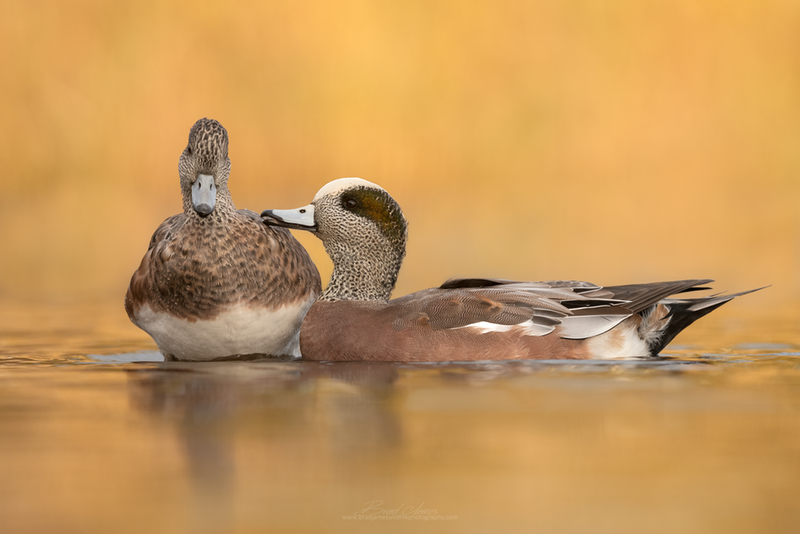 This American Wigeon pair for example where the female appears to shy away from the male who was attempting a kiss. 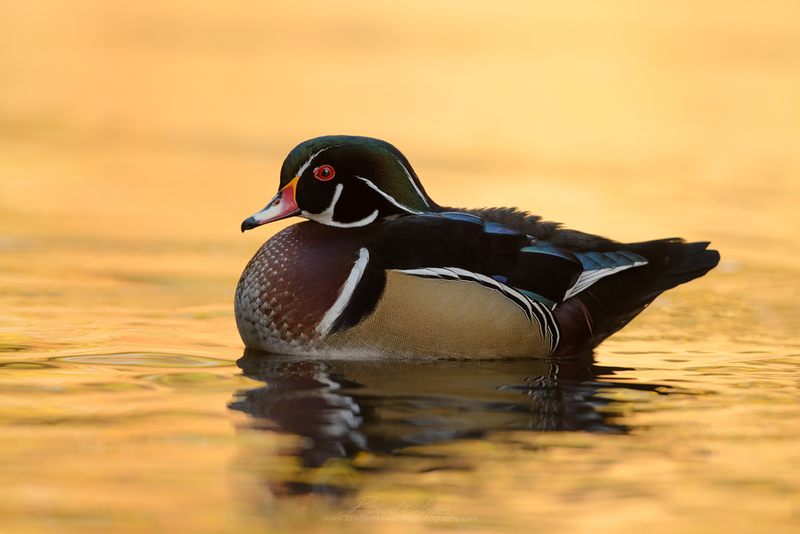 Waterfowl Photography can be difficult and frustrating at times so I hope that you find these tips useful and perhaps you give them a try on your next outing. If you haven’t signed up to my Newsletter yet, I invite you to do so at the top of the page. My Newsletter contains bonus photography tips, plus any upcoming deals on my eBook and it is also a great way to be notified when I post new content.